Samovar, a combination of the word “sam“, meaning self, and “varit“, meaning “to boil”, is a traditional Russian teapot. Although originally intended as a tool to boil water for tea, its usage has evolved through time, and it became a symbol of tribute to the ancestors and a sign of hospitality. 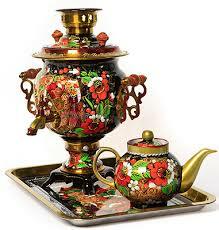 Usually, samovar is made from nickel, polished brass, plain iron, bronze, or silver and gold for more expensive ones. Samovar consists of an urn, a pipe running from the top to the bottom, and a handle on each side. A small teapot is placed on the top of the pipe, filled with tea leaves to create the tea concentrate. Unlike the Chinese way, the tea and the water is boiled separately. Firewood is placed at the bottom, the urn filled with water, and the tea leaves placed on the top of the pipe. The choice of firewood is important in this case, as different kinds of firewood each create unique scents. After lighting the firewood, wait until the water starts to boil. The urn will whistle, puff, and seethe when the tea is ready. People drink the tea by taking a little tea concentrate, and dilute it with the hot water from the tap. In some places, it is believed that the samovar has a soul, as it creates different seething and whistling sounds with each different fuel. The explanation for this phenomenon lies in the unique shape and structure of the samovar allowing the combination of boiling sounds and the whistles to create a harmony similar to a song. This belief leads to the proverb “The samovar is singing”. For a list of proverbs, check out the article Proverbs and Idioms in Russian Language. Samovar would be incomplete without the tea. It begins in the 1720s, during the reign of Peter the Great. At the time of his reign, the emperor agreed to sign a treaty allowing the trade of goods between Russia and China. China started to export their tea in large quantities, and in the end of the 1720s, black tea became a highly demanded commodity in Russia. At that time, there were no electricity, which necessitated a way to boil teas more efficiently, leading to the invention of samovar. There are several stories about samovars’ origin, and only one was truly, historically verified. According to the first story, Peter the Great brought back the early version of the traditional kettle from his trip to the Netherlands, and he asked Russian craftsmen to remake and replicate it. The second story says that the samovar was brought from China by an unknown figure, presumably amidst the massive imports of black tea during Peter’s reign, and ended up with the Russian craftsmen replicating the design. The third, historically verified story says that the first recorded samovar was made in the 18th century, year 1779. It was made from copper by the Listlyn brothers, commissioned by Nikita Dividov, the first of the line of Russian industrialist dynasty. The brothers originated from Tula, a city known for its metal-workers and arms-makers. More and more craftsmen opened their own shop to sell their samovars. In the span of 70 years, the samovar slowly but surely became popular throughout Russia. At that time, samovar was very expensive. It was sold in weight ranging from the portable one cup samovar, to the massive ones capable of holding 10 liters of water. Predictably, the heavier the samovar, the more expensive it is, so the price of one samovar could easily skyrocket to ten gold rubles, a whole month’s salary for the average citizen. However, once one manages to buy a samovar, it is owned for life and for the many generations to come. The samovar would be passed down through generations as family heirloom. Nowadays, the tea, and in turn, the samovar itself became a symbol of a long, friendly conversation. The samovar would be set on the center, several assortments of bread, cakes, and candies placed all around it, the combination of tantalizing scents creating an unforgettable atmosphere at home. The traditional samovars are commonly brought as souvenirs, while the electric ones use a heating element in place of the pipe and thus usable in any common Russian household. The more artistic samovars became a rare, coveted collectible item and thus fetches a high price. Drinking tea was, and still is, one of the favorite pastimes of Russian people since the end of the eighteenth century, and it is shown from the high popularity of the traditional kettle and the association with a long conversation within a friendly and familial atmosphere from the combination of the unique scent from the kettle and the sweet treats on the side. If you like this article, try reading our other article about the History of Matryoshka Nesting Dolls. For beginners in the art of Russian Language, please check out How to Learn Russian Language for Beginners, Numbers in Russian Language, and Personal Pronouns in Russian Language.